I didn’t think I’d get more time on the sawmill today. Rain was in the forecast. It did rain a bit in the morning, but everything was fine this afternoon. I’m way behind on a farrowing shelter. Time to get cracking. 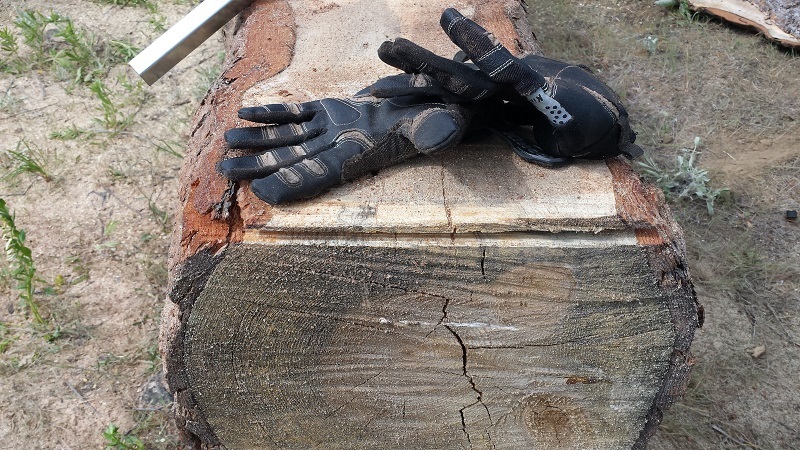 The first thing I did was to cut the long round that was the trim from the log. I cut it into two pieces and used them as a stand for the log. It’s not a fun thing to push that mill with the log on the ground. If I had left the log on the ground, I could have used the side I cut previously to guide the mill. That side was now the “down” side. This meant I had to use the rails again. I had set up the rails at the maximum width. I suspect that width is for the larger Alaskan mill that Granberg makes. It was very difficult to keep the mill on the rails at this width, so I brought the rails closer to each other by about an inch. I lined up the rails and put in the duplex nails. I had trimmed the log a bit too much yesterday, and this meant that the rails were about 3 inches longer than the log. The nails didn’t get as much bite as I had hoped. Sure enough, a nail came out as I cut. Maybe shim the extra space and screw through it into the log? My cut was a bit shallow. You can see this in the pic below where I didn’t get under all of the bark. I’m fine with that. The thing to watch out for is that my rails started to shift back and forth, because the top piece was weak where there was only bark. I had to push carefully in order to avoid wiggling the rails. This cut went fast. There wasn’t a lot of resistance because it was cutting the edge of the log. Not a lot of “meat”. Time to cut planks. This is for pig housing, so I don’t care about irregular edges with bark. Whoah. That’s thin. I added another half an inch. The cut was still thin, but what I wanted. I cut three planks once I had the depth dialed correctly. The cutting was much slower than I expected. Part of this was the log. I was cutting wider pieces. Part of this was the chain. It was getting dull. It really showed on the last cut. The cuts took about 15 minutes each. Twice I had to stop in the middle of the cut to fiddle with the chainsaw. 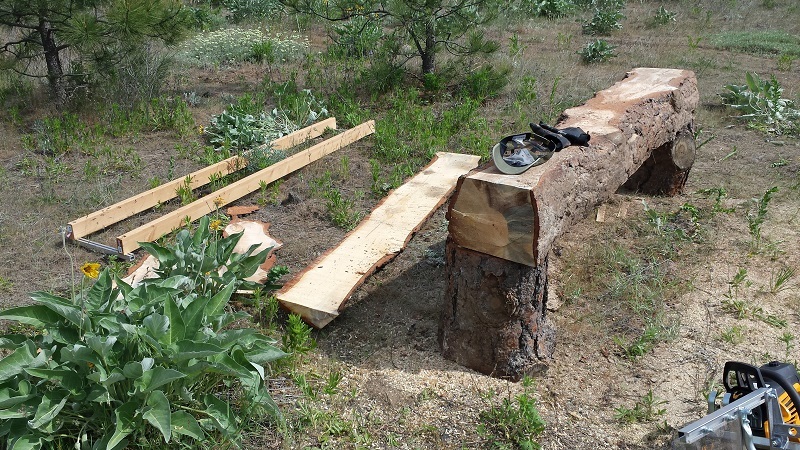 Plus, I took at least a 10 minute break in between planks as well as the top cut. Between yesterday and today, I crosscut two rounds, ripped 2 sides of the log and 3 planks as well, for a total of 7 cuts. I used 4 tanks of gas and part of another (small tank?) and filled the bar oil twice. I’m guessing I’ve used just under half a gallon of gas. My duplex nails are starting to get a bit bendy. I’m going to buy more of them. I have one more ripping chain. I’ll switch to it the next time I cut. I doubt it will stay sharp enough to finish the log, which is about 18″ in diameter. I plan on having a total of 4 ripping chains. One thing about the mill. The plexiglass doesn’t cover all of the bar. I’m using the biggest chainsaw the mill takes, so I’m not surprised. It might be a good idea to add another piece of plexi to keep the sawdust from flying into my face.